click image for close-up When persons being held as slaves were accused by their masters of insubordination, or of eating more than their allotment of food, they might expect to be fitted with an iron muzzle. In his autobiography, Olaudah Equiano described his first encounter with such a device in the mid-1700s. . .
"I had seen a black woman slave as I came through the house, who was cooking the dinner, and the poor creature was cruelly loaded with various kinds of iron machines; she had one particularly on her head, which locked her mouth so fast that she could scarcely speak, and could not eat or drink. I [was] much astonished and shocked at this contrivance, which I afterwards learned was called the iron muzzle." 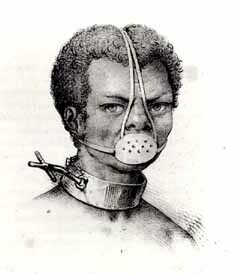 Slave with Iron Muzzle is an illustration from the 1839 publication, Souvenirs d'un aveugle, by Jacques Etienne Victor Arago.